WristAssist™ can be used for extending and stabilizing the wrist at a consistent 30° angle during vascular access procedures, including arterial line insertions and cardiac catheterizations using the radial artery or vein. Made with soft comfortable material and thick padding for enhanced patient comfort, WristAssist has a flat front edge to provide a stable wrist support platform and helps to prevent patients from flexing their wrist during extended arterial line deployments. This helps achieve more trouble-free line insertions, assures the integrity of the line and facilitates invasive monitoring for extended periods. 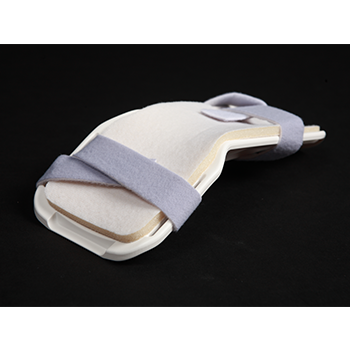 Foam pad can be used to easily adjust angle of extension and cushion IV lines on the dorsal surface of hand or wrist. WristAssist™ is used by clinicians when inserting arterial lines or catheters into the radial artery or other arteries in the wrist.